How do you make me walk 14 blocks and 1 avenue to get lunch? 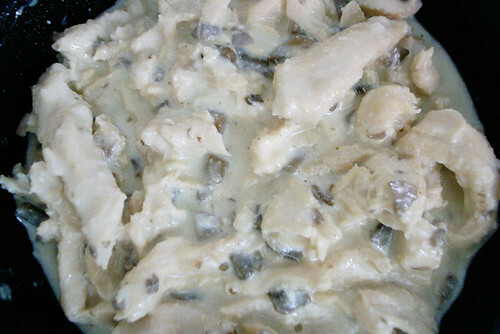 Have frakkin’ chicken stroganoff, another fine recipe from Mama Bear or Mama Schnitzel or Mama Oleg. I sadly missed out of the lamb stew from last time and I heard many praises for it and that made me more sad. So when I found out that they were going to serve one of my FAVORITE dishes I had to go get some. 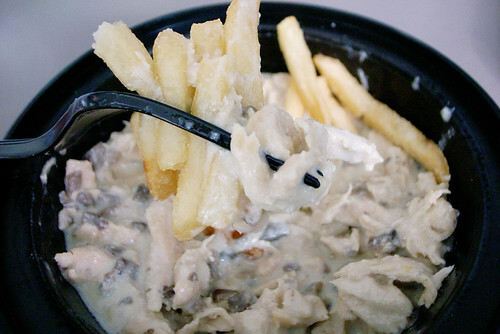 What’s not to love about creamy mushroom sauce and chicken served with fries?! It had so many levels of deliciousness. The sauce was perfect but I did wish the mushrooms were a little bit bigger. Steps to eating fries and chicken stroganoff. Fork stab stab stab at fries then fork stab stab stab at chicken stroganoff and then into mouth. Repeat. Can’t wait to see what Oleg and family will be serving next time.